Golden Glow in full bloom are a really impressive sight with their masses of bright yellow flowers. Normally the clumps will be five or six feet tall… this year with all the rain we’ve had, they are even taller than usual… probably very close to eight feet. This plant has a tendency to flop over under the weight of its flowers… it’s the one thing about it that I don’t like, especially since I have too many of them to stake. So far this year though, all my Golden Glow are still standing tall… I’m wondering if all the moisture we’ve had has perhaps made the stalks more sturdy. Golden Glow is a perennial that starts blooming here in late summer and usually continues to bloom until our first early frost. It is part of the coneflower family and thrives in sun and moist soil and is a very easy plant to grow. It will spread enthusiastically (sometimes too enthusiastically) if it likes where it is planted. 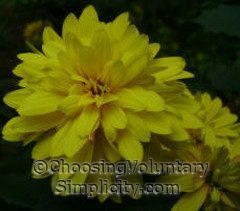 The flowers are bright yellow with double petals, and they are large… around three and a half inches in diameter. Butterflies and bees find them very attractive. Supposedly Golden Glow is both deer and rabbit resistant… we don’t have wild rabbits here, but we do see a lot of deer, and it’s true that they have never shown any interest in this plant. 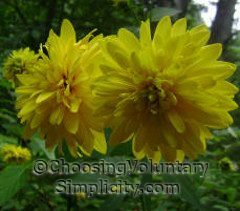 Golden Glow is an heirloom plant, and my Golden Glow has a family history. My first plants came from my mother’s garden, and her first plants came from her mother’s garden… before that, my mother’s side of our family was growing these same Golden Glows at least as far back as the early 1900’s. It’s a nice connection to know about. Loved the pictures of the gloden glow. I really loved the story tracing the heritage of the plants. It is so important to know these things and the older I get it really is most important. How wonderful to know that someone in you’re family also loved looking at these flowers the way you do! That connection is there! I have seen this plant growing and wondered what it was so I could get some. I love it! And the fact that bees and butterflies love it makes it even more special. 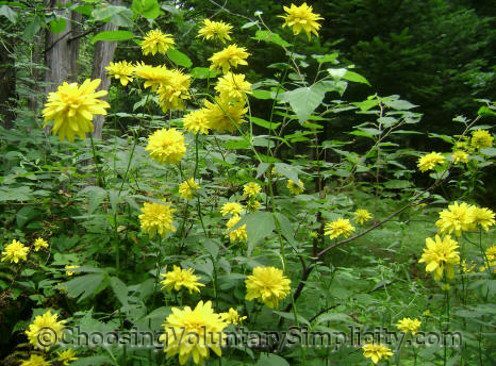 My mother grew this when I was young and she called it Golden Glory. Unfortunately she lost it many years ago when the outhouse was demolished. Since my Mum passed away some years ago I have often wondered what its real name was. I live in Australia and intend to track it down because it brings back a lot of wonderful childhood memories of when Mum and I would spend hours together in the garden. I am so happy to finally find out what this was called. It is blooming prolifically right now and I love it. They are great as cut flowers and last a long time. The only thing I have against them is that they are TOO healthy, in that they spread fast and are taking over my perennial garden, are taller than anything I have! I think it is just wonderful that we still have a continuation of some of the ‘old’ flowers from our ancestors. I rescued a few palnts almost 20 years ago from an abandoned farmstead and put them in my garden. In about five years i had to take them out and move them as they had increased to over a hundred plants -very invasive. I try to keep them in check and give a lot away every summer. They are also known as Outhouse Flowers and are a very old variant of the native green head or cut-leaf coneflower. Some of mine planted by my barn have reverted to native type. Fun to have around. Hi Shirley :) If you want non-floppy (and simple), try the species, with single flowers. It will flop under the weight of Goldfinches, picking seeds,:) but otherwise, I like the species better. Stands up better, and rarely looks wilty in the afternoon sun . Most of the time ( that I’ve seen) the double, cultivated types, look wilty every afternoon. No harm done, but I don’t like the look. ps Yes , moisture helps, as they are native to riverbanks, and other such places . Thank you! We just found these growing at a house where relatives of my girlfriend once lived. It’s now an abandoned farmstead, but some of these will now be coming home to our house! Thanks so much for posting this information. My grandmother grew these flowers in Northern Idaho. She always called them the fall-over-flowers. A few years ago I got a start from my mom and they quickly livened up a boring retaining wall at our Central Idaho house. These past year we moved to Kansas and a pot of these flowers came with us. It is great to finally know their official name.